Was flicking through some notes yesterday and found this handy pitch guide for the different tones in Taiwanese – handy in the sense that it may be of use to some people other than pitch deaf me. 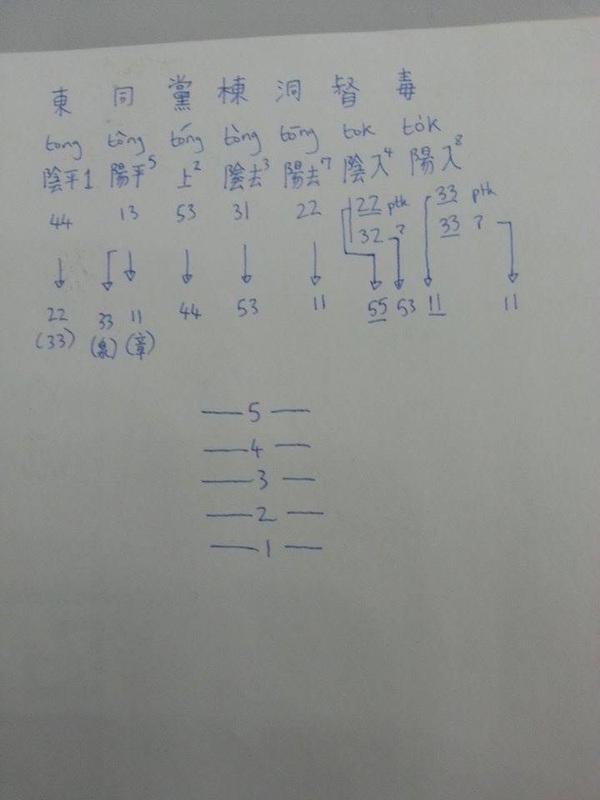 The first line is the character; the second line is the romanization; the third line is the linguistic description of the kind of tone it is in Chinese along with the number commonly attributed to the tone in superscript (note that fourth tone changes when it ends in a glottal stop or with p t or k); the fifth line represents how the tone changes when used before the final character in a clause. Phrases are subject to tone changes depending on the order they come in the phrase (it can get pretty complicated if you try and learn it from a theoretical point of view, so it’s often easier to just listen to a friend and repeat). What makes up a phrase is more complicated – as you often have to decipher a word group and then the last character doesn’t change tone, but the preceding ones do. There is also characters that bear less stress than normal characters, in this case the unstressed characters are read with a 2-1 tone (see picture above) and the characters that precede them are read in their original tone (the fourth line in the image above). There is also a rule involving tripled adjectives, which complicates things further – in that the first of the three repeated characters tone changes tone in a different way from normal. My Taiwanese linguistics Yang Hsiu-fang teacher has a brilliant book written in Chinese which gives a really clear explanation of all the linguistic rules, which will be far clearer than my poor attempts. This entry was posted in Home, Taiwanese Language and tagged dialect, 閩南語, 音調, 語調, Minnan, taiwan, Taiwanese language, tones, 台灣, 台語, 教學, 方言 by ladenframe. Bookmark the permalink.